The costliest dress of the 20th century, was priced at £ 1 million – a high-waisted and embroidered white muslin evening gown decorated with 516 diamonds. An armoured car took it from the makers, Schiaparelli, to the fashion show at the Ritz, Paris, in 1977. Shoes extravagant enough to match it could not be found, so the model wore it barefoot. The dress was eventually bought for an Arab princess whose identity has not been revealed; and, according to the makers, she still has it. Feather-light shoes created by New York designer Yanturni in the 1920s took up to three years to make, and he refused even to make a start on a pair without a $1000 deposit. He made plaster casts of clients’ feet and moulded the shoes around the contours. Yanturni made 300 pairs for the Spanish-American hostess Rita de Ascota Lydig. Some were made with 12th century velvet, some of lace appliqué, others of brocade or gold and silver metal tissue. Mrs. Lydig collected violins so that Yanturni could use the delicate wood to make his shoe-trees. Designer Cecil Beaton once claimed that a Yanturni shoe, complete with its tree, weighed no more than an ostrich feather. Only at the start of the 19th century did fashion-concious men begin wearing trousers in preference to knee-length breeches. Tsar Alexander I of Russia regarded trousers as subversive, probably because they were worn by extremists of the French Revolution. In 1807, Alexander ordered his troops to stop all carriages – and any man inside wearing trousers had them instantly cut off at the knee. French actress Leslie Caron, while a small girl, had the idea of boiling her underclothes in a tub of perfume to give them a long lasting fragrance. It worked a treat. Leslie, however, had no reason to worry about the economic impracticality of the idea. The tubful of scent cost her nothing – her family owned the perfume house of Caron. A Dutch model named Wilhelminia, probably still holds the world record for appearances on the covers of the world’s top fashion magazines – 250 covers between 1960 and 1967, when she retired. In the 20th century, that was almost twice the combined total amassed by the runners-up, British models Jean Shrimpton and Twiggy. Despite the exposure Wilhelminia’s name remained almost unknown to the general public. The first model girls, more than a century ago, were hardly seen, never heard, and chosen purely as clothes horses. They had no social status or respectability, and were not even picked for their looks in case they drew attention away from the creations they were showing off. The fashions set in France were eagerly imitated all over Europe. The cost became part of everyday wear in this way, having developed from the military dress sometimes worn by the king. 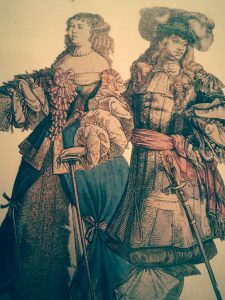 Louis XIV promoted French fashions, sometimes by force. When his troops occupied Strasbourg – then an independent city – in 1681, its citizens were ordered to adopt French fashions within four months. Faded photographs of moustachioed Victorian males show only one side of 19th century Britain’s love-hate relationship with the hairy upper lip. A wealthy Englishman named Henry Budd died in 1862, leaving one London Estate, Pepper Park to his son Edward, and another estate, Twickenham Park, to his second son William – on condition that they did not wear moustaches. Seven years later, a British upholsterer left £10 to each employee, “if no moustaches”. In 1904, Regent Street drapers in London stopped employing assistants who wore moustaches (or patyed their hair in the middle). The Bank of England, by contrast, neatly and surreptitiously avoided interfering with staffs’ private lives: moustaches were merely forbidden “during working hours”. Mrs. Isabella Beeton and her encyclopaedic “Book of Household Management” are justifiably famous. But her unsung husband, Samuel Orchard Beeton, has had an even more lasting influence on women: he invented the fashion magazine. In 1852, four years before he was married, 21 year-old Samuel published “The Englishwoman’s Domestic Magazine”. With each issue, he gave away a paper dress pattern, starting, in Volume 1, with ‘A Lady’s Jacket and Vest’. There was then no ready-to-wear fashion trade. Mr. Beeton’s giveaway patterns and practical instructions in his magazine established home-dress making, and gave fashion to the nation’s housewives for just the price of the material – and, the magazine, of course. False eyelashes were invented by the American film director D. W. Griffith, when making his 1916 epic “Intolerance”. He wanted actress Seena Owen to have lashes that brushed her cheeks, to make her eyes shine larger than life. A wigmaker wove human hair through fine gauze, which was then gummed to her eyelids. “Intolerance” was critically acclaimed but flopped financially, leaving Griffith with huge debts which he might have been able to settle easily – had he only thought to patent the eyelashes. Nothing evokes a more appealing image of demure 19th-century femininity than the ‘poke bonnet’. Yet it was originally meant to conceal the face rather than add allure to it. It was devised by an aristocrat named Baroness Oldenburg in 1818 to hide her unfortunate looks – the bonnet’s side flaps curled around and all but covered her face. Intrigued by the bonnet, pretty women of the day began decorating it with ribbons and flowers and turning back its sides to give coy and provocative glimpses of their faces. 5 Facts About The Coolest City On Earth. Amsterdam!